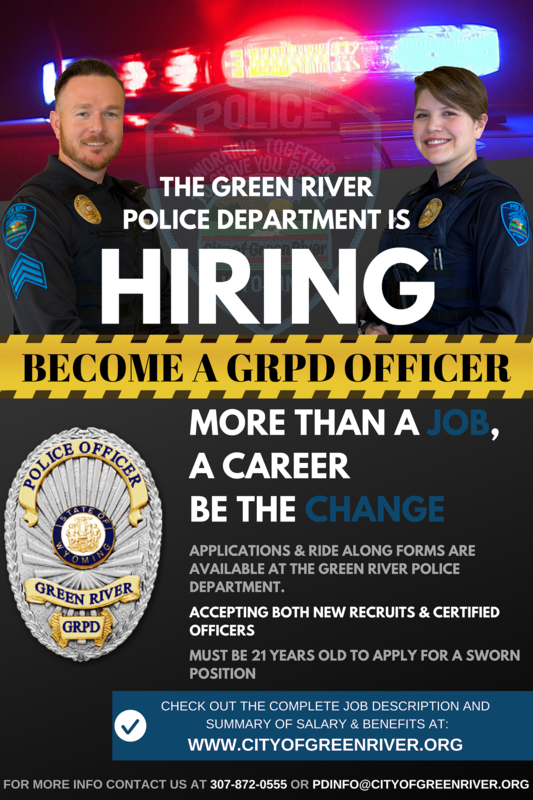 Employment with the Green River Police Department provides an excellent opportunity for a law enforcement career with a professional and progressive department. Standards for selecting and hiring "Green River's Finest" include completing an extensive pre-employment process which begins with the T.A.B.E. Entry Level Exam, an oral interview, complete background investigation, polygraph interview, as well as psychological and physical examinations. If selected for hire, officers are required to comply with certification requirements set by the Wyoming Peace Officer Standards and Training Commission. Officers must successfully complete the 3-month basic Police Training Academy in Douglas, Wyoming, then annually recertify within the department per P.O.S.T. certification. P.O.S.T also requires officers to complete 40 hours of certified advance training bi-annually. To maintain or enhance their skills, officers are also required to attend monthly department training for weapons and other police related topics. Once employed, officers are issued all equipment and uniforms necessary for the job. While at the academy, recruits are paid a full salary of a first year officer. Upon graduation from the academy, the new officers begin an approximate 12-week Field Training Program. This program is designed to give them on the job training with an experienced police officer and allow them to work on various patrol shifts. After completing the Field Training Program, new officers are assigned to a patrol shift and evaluated throughout their 6-month probationary period. The TABE test is required to be completed before submitting an application. The TABE test is compiled of reading comprehension, report writing, and observation skills. The test is administered at the Western Wyoming Community College. It all starts by registering to take the WWCC T.A.B.E. test through Western Wyoming Community College Adult Learning. For testing times, you can contact WWCC in Rock Springs at (307) 382-1829; WWCC in Green River at (307) 875-5532; or the Green River Police Department at (307) 872-0555. Cost is $5 and scores must be higher than a 12.0 for passing. Applications are accepted year-round, and can be filled out at any time. For more information, and to speak directly with an officer, please contact Cpt. Shaun Sturlaugson or Cpt. Janet Kauchich or call 307-872-0555. Once applicants have completed the TABE testing and PT- physical testing, interviews will be conducted with the Green River Police Interview Board. Applicants that are accepted as potential hires will be subject to a full background examination, polygraph and psychological exam. Once the background is complete, potential hires will be given a conditional offer of employment. Non-Sworn positions with the department include: Code Enforcement Officers, Evidence/Property Officer, Public Relations Officer, or School Crossing Guards. Non-Sworn Applicants are subject to an oral interview, complete background check, and can be subject to a polygraph or phycological exam.